Common to people of every time and place is a longing for the truth. We wish to know! We wish to know the purpose of our life, why we are here on earth, where we came from, whether there is a God, who this God is, whether there is an afterlife, and so much more! These most basic and fundamental questions are with a bit of luck in the forefront of our minds. And if they don’t seem to be, it’s never too late to start! This book offers one of the most answers to these questions. It offers the answers found is our Creed. At first, the Creed can seem dry and unimpressive. It can even seem confusing and overly academic. But when properly understood, the Creed holds the answer to the questions we so deeply seek. About this Series: The My Catholic Life! 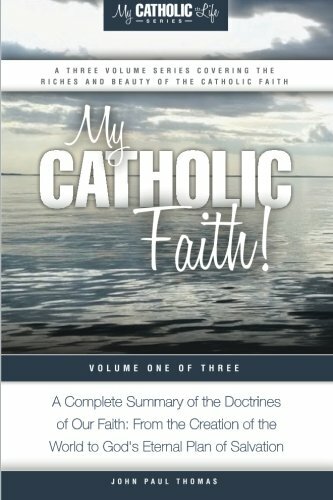 series is a three volume series written as a complete summary of our glorious Catholic faith! The goal of these books is to answer the difficult and deep questions of life in a clear and understandable way. We wish to know who we are and what life is all about. And we wish to know who God is and what He has spoke to us through the ages. Volume One, My Catholic Faith! is a summary of the Apostles and Nicene Creed. This volume looks at everything from the creation of the world to God’s eternal plan of salvation. Other topics include: Afterlife, saints, God, faith, and the Church. This can be a summary of the teaching of the Catechism of the Catholic Church # 1-1065. Volume Two, My Catholic Worship! is a summary of the life of grace found in prayer and the Sacraments. So frequently the Sacraments can be seen as dry and empty rituals. But they are, actually, the greatest treasures we have! They are God’s true presence among us! This can be a summary of the Catechism of the Catholic Church #1066-1684 and #2558-2865. Volume Three, My Catholic Morals! is a summary of the morality itself, knowing how we choose right from unsuitable, as well as a summary of all of the moral teachings of our faith. This can be a summary of the Catechism of the Catholic Church #1691-2557.